What the Trico mayflies lack in size, they make up in quantity! This mayfly family comes off in late summer to fall, and is renowned for its' "Blanket Hatches" that cover the rivers and streams they inhabit. While the small dark nymphs can be matched with a number of patterns, some of the best fishing comes with the spinner fall as the adults die after mating and laying their eggs. Our trico selections have been crafted to allow the angler to take advantage of and fish every life stage of this important mayfly species (Nymph, Emerger, Dun, Spinner, and Spinner Fall). The Medium Selection will expand upon both the dry and wet life stages and includes 14 dry fly patterns and 10 wet fly patterns. 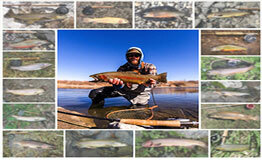 The Large Selection will exhaustively cover every life stage and includes 20 dry fly patterns and 16 wet fly patterns.